Industrial production in the A.C. of the Basque Country in October 2007 grew by 1.7% as regards the same month of last year, in homogenous terms of the working calendar, according to EUSTAT data. In the first ten months of the year accumulated growth was 3.4% in relation to the same period of 2006. In October 2007, compared to September, industrial production in the A.C. of the Basque Country increased by 0.2%, once seasonal effects had been corrected. The balance of industrial activity for the first ten months of the year closed with a 3.4% increase of the inter-annual rate, based on the outstanding performance of capital goods and intermediate goods, despite the negative rates offered by the energy sector and by consumer goods (especially that of consumer non-durable goods). By sectors and using the classification of the major industrial sectors, inter-annual evolution of the October 2007 index, compared to October 2006 shows growth for Capital Goods, which rose by 4.0%, and Intermediate Goods, which increased by 3.1%. Consumer Goods grew by 4.6%, as a result of the increase experienced by Consumer Non-Durable Goods (8.2%), given that Consumer Durable Goods fell by 1.8%. The Energy sector experienced a 10.3% decrease during the same period. 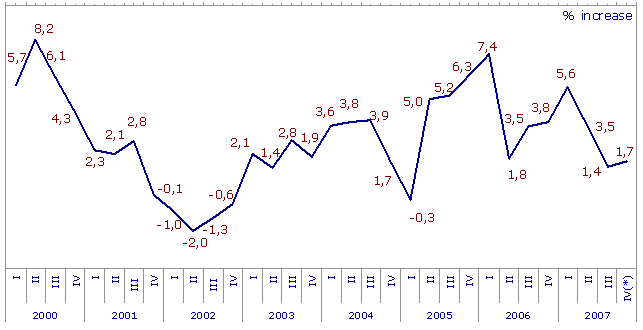 Inter-monthly variations for October 2007, in relation to September 2007, were positive for all the major industrial sectors except for Energy, which fell by 5.9%. Capital Goods rose by 0.2%, Intermediate Goods increased by 1.0% and Consumer Goods grew by 3.2%. Of the two component parts of Consumer Goods, Consumer Durable Goods experienced a 2.0% inter-monthly increase, while Consumer Non-Durable Goods rose by 3.7%. By province, inter-annual evolution of the Industrial Production Index performed positively for Álava and Gipuzkoa, which grew by 3.3% and by 3.1% respectively. In Bizkaia, however, there was a 0.4% decrease. Inter-monthly rates, which is to say October 2007 in relation to September 2007, were also positive in Álava and Gipuzkoa (0.2% and 1.2%, respectively), but in Bizkaia fell by 0.6%.